When hosting services locally, you need to provide all the required infrastructure, which can get expensive. AWS (Amazon Web Services) does provide guidance on the minimum requirements for hosting a service locally. 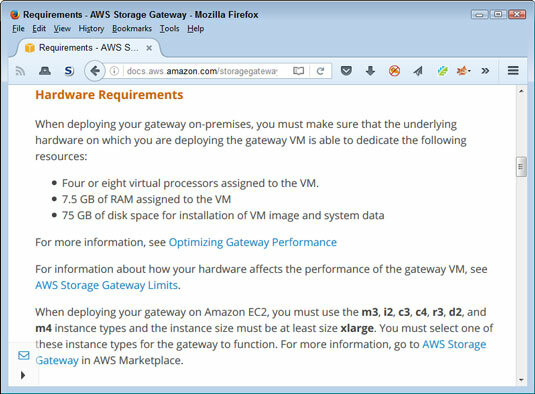 For example, the figure shows the requirements for the AWS Storage Gateway. Make sure that you can actually host the service locally. A good rule of thumb when hosting services locally is to view any vendor-supplied requirements as minimums. If you don’t plan to load the service heavily, these minimums usually work. 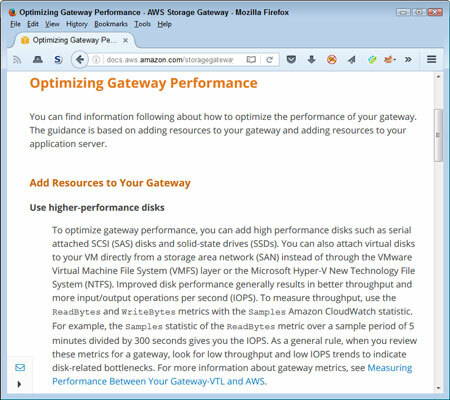 However, when you click the Optimizing Gateway Performance link, the first suggestion you see is adding resources to your gateway, as shown here. Planning for too much capacity is better than for not enough, but getting the configuration as close as possible to what you need will always help financially. Plan ahead for sufficient resources. Not all the services will work locally, but you may be surprised to find that many do. The issue is one of defining precisely how you plan to use a given service and the trade-offs that you’re willing to make. For example, when hosting a service locally, you may find it hard to provide the same level of connectivity that you could provide to third parties when hosting the same service in the cloud.